"A farmer went out to sow his seed. As he was scattering the seed…(Matthew 13)." Farming has changed over the centuries…what used to be much more organic has yielded to methods that are structured and mechanistic. In essence, that is what has occurred in much of our journey and praxis as followers of Jesus. We have yielded to formulas and specific, "proven" ministry/life strategies and have become less dependent upon the Spirit's leadership and spontaniety. I don't want to bore you with a long post…but sometimes these things are necessary to get us all thinking and praying in a new direction. Now, let's move on to Systems thinking – briefly, Systems analysis is a theory of analyzing human behavior (in conjunction with organizations, groups, and institutions) that views entities as a unit and uses “systems thinking” to describe the complex interactions in the unit. Systems thinking can be defined (as an approach to problem solving) as viewing "problems" as parts of an overall system, rather than reacting to present outcomes or events and potentially contributing to further development of the undesired issue or problem. Systems thinking is a framework/paradigm that is based on the belief that the component parts of a system can best be understood in the context of relationships with each other and with other systems, rather than in isolation. The only way to fully understand why a problem or element occurs and persists is to understand the part in relation to the whole. Organic Systems thinking stands in contrast to Descartes’ scientific reductionism and philosophical analysis (i.e. 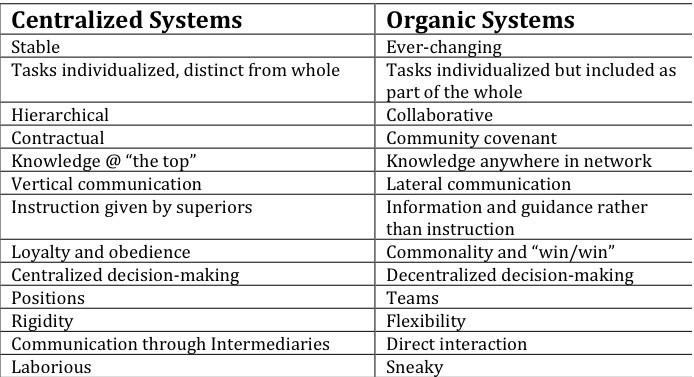 mechanistic systems) it proposes to view systems in a holistic, living manner. Now, follow me here…our lives as followers of Jesus is essentially an organic “Movement “. Jesus calls us to be committed to building a movement of disciples/Christ-followers that are difference makers in their world to God’s glory. Jesus invited us to join him, organically, in the reproduction of life. His action in the world can be best said to be a living, thriving, reproducing organism (Mark 4) that allows life-in-the-Spirit to spread viraly from one disciple to the next. His ekklesia/church is alive as illustrated by a seed (Mark 4) that brings forth 30, 60, or 100-fold reproduction. The life of Jesus in me is passed on to the life of another (2-fold) which is passed to the life of another (4-fold) which is passed to the life of another (8-fold), etc. That is the way of organic/viral life and this is what the kingdom IS. This is ultimately what Jesus invited us to become part of: discipling viral disciplers. Kingdom life is viral, organic, and, by nature, a movement. That is why we need to be “careful” about defining the “end game” (what “success” looks like in ministry). Ministries (in whatever paradigm we could choose to use) do not naturally reproduce nor become movements. In fact, every “model” has a shelf life. They may serve a purpose for a season, but when that season ends (and it will) the “movement” is over. Discipling viral disciplers is the end game. This places YOU and ME squarely in the midst of reproductive life that the kingdom is intrinsically about. We become movement-starters not church-starters. We release disciples who will influence the world throughout their lifetime and beyond. When we start “churches, communities, meetings, etc.”, our focus tends to be on the communal gathering—what to do, how to do it, what it looks like, etc. We may say to ourselves that we are learning to “be” the church but often our priority remains on developing the structure/form/institution. When following Jesus and inviting others to follow him becomes our focus (discipling viral disciples), we have to shift from the “gathering” mentality to the “lifestyle-going” mentality. This shift will propel us from being church-starters to movement starters (where churches and gatherings spring up along the way). ← Christmastide – paradigm for Kingdom living in 2010?